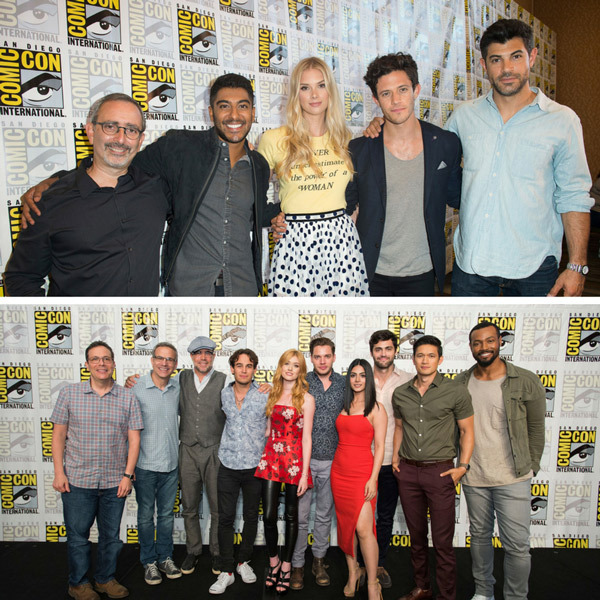 The stars and executive producers from Freeform's hit drama series "Shadowhunters" and "Stitchers" returned to San Diego Comic-Con on July 20. First up, fans got an in-depth look at procedural drama "Stitchers" with sneak peeks, behind-the-scenes stories and an exclusive clip at an upcoming episode. Panelists included cast members Emma Ishta, Kyle Harris, Ritesh Rajan and Damon Dayoub, as well as executive producer Jeff Schechter. The panel was moderated by TV Guide's Damian Holbrook. Immediately following "Stitchers," the cast and creators of drama series "Shadowhunters" took to the stage to spill secrets on season three and share an exclusive clip from an upcoming episode. The panel, which was moderated by IGN's Matt Fowler, included stars Katherine McNamara, Dominic Sherwood, Alberto Rosende, Emeraude Toubia, Matthew Daddario, Isaiah Mustafa and Harry Shum Jr., along with executive producers Todd Slavkin, Darren Swimmer and Matt Hastings. The casts of "Stitchers" and "Shadowhunters" also participated in an autograph signing. "Shadowhunters" and "Stitchers" air Monday nights on Freeform.